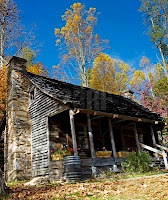 To enjoy this blog one must understand that at the time of the described event there was no electric, no tv, no autos and only wagon roads to isolated farms in the hills of West Virginia. Life was quite simple compared to this day and time. 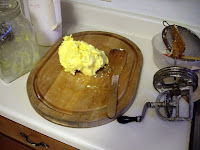 Butter, for example, was a home churned treat. 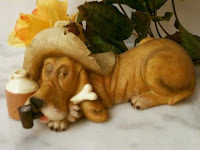 This blog is about a Pierce Family story. Family folk lore is so important where the truth never gets in the way. It allows current generations to have an understanding of what life was like in days gone by. This creates a sense of continunity with young folk who are still developing their character. Family stories also provide joy to long winded survivors who love to retell the same old stories. There are so many stories in our family. My favorite concerns a fox hunt and a haunted house. A true story, aren't they all, involving my Grandpa and my Uncle Bob. It is a long story for another blog. Today I'll share the story about the "The Long Legged One". My Uncle Albert was the oldest of four children. Dad was the youngest. As adults Dad was a taller man than Uncle Albert. Who was the tallest when they were young and courting two sisters was a debate that lasted a life time. Through the great depression when I was a small child we thought of Uncle Albert as our rich uncle. He married a wealthy lady and he had a foreman's job thoughtout the difficult times of the 1930s. He lived in Dunbar, WV which in those days was a long ways away, although today it is maybe a 45 minute drive. 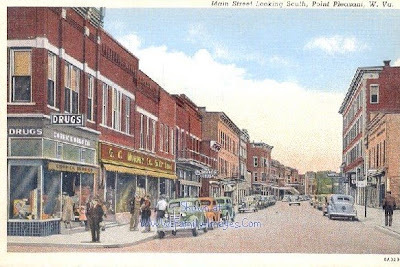 Uncle Albert seldom came to Point Pleasant in those days. I don't recall that his wife, Aunt Ruth, ever came. When Uncle Albert came, however, he, Dad and Grandpa Pierce would sit around telling stories and pulling at the jug all night long. The entire family crowded around. Even the dog was entranced. It was the best of times in the worst of times. That jug sure made the stories flow and the tellers to become animated. Uncle Albert's wife was, to say the least, a strong woman. Uncle Albert didn't get to pull on the jug that much. One story we were sure to hear was of the time they were dinner guests of two sisters whom they were courting. After dinner, in the dark, Dad and Uncle Albert were "courting" the girls on the front porch. The parents had gone to bed. In those days parents usually slept in the "front room" where the fireplace was located. The girls father called out "Girls, have the boys gone home?" The answer was "No Pa". After awhile the father repeated "Girls, have the boys gone home yet?" The answer again was "No Pa". For the 3rd time the father called out "Girls, have the boys gone home yet"? The 3rd time one of the boys--which one a matter of debate--told the girls to say "Yes". The girls said "Yes Pa". Pa replied I DIDN'T CARE HOW MUCH THE BOYS ATE BUT DIDN'T THAT LONG LEGGED ONE GO AFTER THE BUTTER? Uncle Albert always pointed out that Dad clearly had the longest legs. Dad always argued that when they were courting these girls he wasn't the tall one at all. Uncle Albert and Dad are long gone and who was the long legged one is still a matter of contention. My opinion? I bet they both went after the butter. "A family tree will die if nobody tends the roots"